Starting solids is an exciting milestone in your baby’s development. With all the advice on introducing solid food, knowing where to start can be a bit confusing. At Karitane, we follow the National Health and Medical Research Council’s (NHMRC) Infant Feeding Guidelines. That’s why we’ve broken down our most frequently asked questions on the topic. The National Health and Medical Research Council (NHMRC) recommends introducing solids at six months – an age at which your baby begins to require more iron and zinc. If you elect to begin prior to this period, only do so under the instruction and guidance of a health care professional, like your family doctor, or paediatrician. If your baby is showing you these cues and is around six months of age, it’s time for solids! Start slow, and progress through foods. Keep in mind that milk is still the priority for your baby’s nutrition. Solids shouldn’t replace breastfeeding or infant formula until nine months. At nine months, offer solids first, then milk. Continue to offer your child breast milk or formula until they turn one. Safety Alert: Use a 5-point harness chair at meal times. Do not leave your baby unsupervised. Which foods should I give my baby? Start with iron rich food like fortified cereals, puree, meat, poultry, fish, legumes and tofu. Food can be introduced in any order and amount that suits your baby. Continue introducing different foods until they are eating a variety of foods from the five food groups. Culturally appropriate foods and preparation are encouraged if they are nutritionally suitable (no added salt and/or sugar). When introducing new foods, it is okay to introduce more than one at a time. If your baby is under nine months, offer milk first. Approximately 30 minutes after they’ve finished their milk, you can offer solids. After nine months, offer milk second. Karitane Tip: Between six and nine months, there is a crucial window of opportunity to introduce textured foods. If you miss this opening, you may increase the chance of feeding difficulties later. A variety of tastes, choices and textures are key! You can do this as soon as your baby is comfortable taking puree. You can do this as soon as your baby can tolerate mash. This usually happens by eight months. Encourage holding softened foods in their hands. By one year, your baby should be able to eat what the family eats – just cut into smaller pieces. Allow your baby to experiment with different tastes and textures. It may take a few attempts before they finally accept certain foods. Karitane Tip: It’s very normal for children to have particular food preferences. Some like vegetables, some prefer fruit, some like only puree, and some like white foods (rice, breads, pasta, dairy). It is important that you encourage your child to try a wide variety of tastes and textures to ensure you’re meeting their nutritional and developmental needs. These foods may cause choking, and should be avoided for the first three years. Nut pastes and spreads may be introduced after six months however. Do not give honey to any infant under one, as it contains a bacteria that an immature digestive system cannot process. It may develop into food poisoning. To prevent food poisoning, do not use any food product with raw eggs. If cooking eggs, ensure the egg white is set and the yolk has thickened. Milk from any animal should not be given to children under one year, as the protein and electrolyte concentrations are unsuitable. High sugar and lack of dietary fibre can change your child’s absorption, bowel habits, weight, appetite and dental health. Tea’s tannins negatively affect your child’s ability to absorb iron. Sugar and caffeine increase risk of poor dental health, gut issues, and weight gain. Safety Alert: Choking is a potential hazard at any age. We recommend staying with your child whilst they are eating. You may also find completing a first aid course helpful in addition to keeping a first aid chart and manual within reach of the kitchen and living areas. How much and often should I feed my baby? When you first introduce solids, your baby may only accept one or two teaspoons of food at each meal. This is very normal. Always let your baby decide how much food to eat. Begin with one solid meal a day until your baby shows cues they’re ready for the next. In the early weeks of introducing solids, it takes around six weeks for a baby to graduate to half a cup of solids a day. 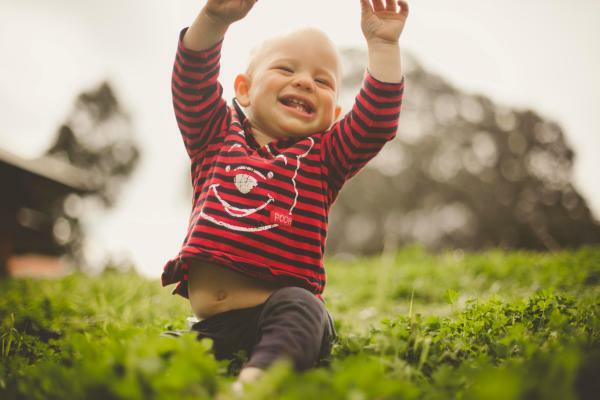 All babies’ energy needs are different. On average a baby eats half to one cup of food at each main meal by the time they’re one year old. Karitane Tip: Always allow infants to satisfy their appetite. Do not push your child to overeat, or force them to finish the bowl. Apply the rule ‘you provide the food, your child decides how much’ at mealtimes. For more detailed information on appropriate solid foods, you can consult the National Health and Medical Research Council’s (NHMRC) Infant Feeding Guidelines. Are there common challenges with solid food? Yes – but don’t worry. Most of these are very minor, and can be easily managed. Learning to eat solid foods can be a messy business! If you’re prepared for a messy situation, it’s often a lot easier to handle. Playing with food, feeling textures, and tipping meals over is all part of the learning process. This will catch any food that’s pushed, thrown or dropped over the side. You can also use a paint smock. Allow them to get used to the feel of food, and really enjoy the meal. Constant cleaning can be irritating and distracting. Focus on enjoying the moment, clean up can happen after. As a parent or carer, you may worry your baby isn’t receiving enough variety. Because you’re the parent, you have ultimate control over the food offered. Sometimes your choices will influence what your child eats over the day, and whether they will or won’t try diverse food. Chips, biscuits and fruit purees often curb your baby’s hunger, reducing their interest in new and/or nutritious food. This is good – let them! Encourage holding a spoon during mealtimes to develop their skills. If your baby is only used to soup or puree, it may be harder to introduce a spoon or new food. Add blended or finger food to the mix to help balance textures. The total number of milk feeds in 24 hours reduces, while solid meals increase to three a day. At one year they may take two snacks if they’re awake and hungry. Filling up on milk reduces the need for varied solid foods. Keep track of whether you offer additional milk feeds to help your baby sleep, as this will impact your baby’s appetite. Consider your baby’s routine, and offer main meals when they’re alert. This can happen as often as 10-20 times before they’ll progress to swallowing. Try pairing something healthy they like, with something they don’t. Have meals with your baby and enjoy a diverse variety of foods to motivate them. Karitane Tip: Your child chooses how much to eat. There is never a good reason to force feed a baby. How much and how often should I feed my toddler? As with adults, toddlers’ appetites change from day to day. Breastfeeding can continue beyond one year of age. If you’ve been using infant formula, you can start to wean your child off it and start offering a cup of cow’s milk. The guidelines listed below identify recommended serving sizes of the five food groups, for children aged one to four. Don’t worry if your child doesn’t eat these all the time – the guide is only indicative. Sourced from National Health and Medical Research Council (2013) Eat for Health, Australian Dietary Guidelines – Summary. Page 43. Karitane Tip: From two years of age children can enjoy fat reduced milk along with the whole family. Safety Alert: Choking is a potential hazard at any age. Don’t put your toddler to sleep drinking from a bottle. Avoid whole nuts, seeds, carrot, celery, apple and any other hard food that may cause choking. If you wish to provide hard fruit and vegetables, ensure they’re cooked, mashed or grated. Cut meat into small bite sized pieces. Discourage running around while eating and drinking. Supervise your toddler during all meals. We recommend completing a first aid course, in addition to keeping a first aid chart and manual within reach of the kitchen and living areas. For additional resources, we’ve put together an informative brochure, and found some tasty, nutritious, and kid-friendly recipes for you to try. Is my toddler gaining enough weight? The majority of babies triple their birth weight by one year of age. Weight gain usually slows to 2-3 kilos in the second year, then to 2 kilograms a year, up to the age of five. If your child seems to be growing at a different rate, don’t be alarmed – these figures are indicative only. If you have any concerns discuss this with your health care professional. Karitane Tip: If you have concerns about your baby’s weight, please consult your family doctor or child and family health nurse. Sourced from the National Health and Medical Research Council Infant Feeding Guidelines, 2012. How do I promote healthy eating habits? There are many simple ways to promote your child’s healthy eating habits. Start small – a little at a time. Realistic choices are often easiest to maintain. These may include swapping white bread for wholegrain, or offering fruit for dessert. You become your child’s role model for eating habits. Note the sugar and salt levels in the food on offer. Keep biscuits, chips, cake and lollies out of your child’s reach. Lemon, cucumbers, strawberries and oranges can sweeten water flavour and help wean your child off fruit juices and soft drinks. Consider motivating your child with a trip to the park, a bike ride, a play date, or special time with a parent. At twelve months, stop giving your baby a bottle and let them drink from a cup. Babies that continue with bottles after twelve months are more likely to get tooth decay, ear infections and iron deficiency. Be creative and focus on the five food groups. Cook extra and freeze for emergencies. Encourage with phrases like “good choice", “I like how you’re enjoying your meal", and “I’m proud of you for trying something new". How do I make mealtime a positive experience? Do this before you sit your child down to eat. They can help wash vegetables, make homemade pizza, choose fruit for fruit salads, or select sandwich fillings. Turn off the television and electronic devices. Don’t be discouraged if your child doesn’t try or like the food immediately. Continue to offer, and don’t criticise. “Thank you for trying that." “Thank you for staying in your chair." Set your toddler’s chair up on a cleanable surface (tiles, vinyl, plastic mat) and use bibs, towels or a smock to protect your clothes from mess. Monitor the amount of milk and fluids your toddler drinks in the lead up to mealtime. Karitane Tip: Your child chooses how much to eat. There is never a good reason to force feed a toddler. Milestones are only a guide as all babies grow and develop at a different rate. Parents play an important role in encouraging their babies development through interactions and play.